There’s nothing worse than getting ready for a night out, going to put on your favourite bold lipstick and then realising that your lips are looking absolutely grim. We’ve all been there – dry skin, flaky lips and a complete lack of moisture. Over the years, I’ve added a few products to my routine which help to make sure I’m always lipstick-ready. 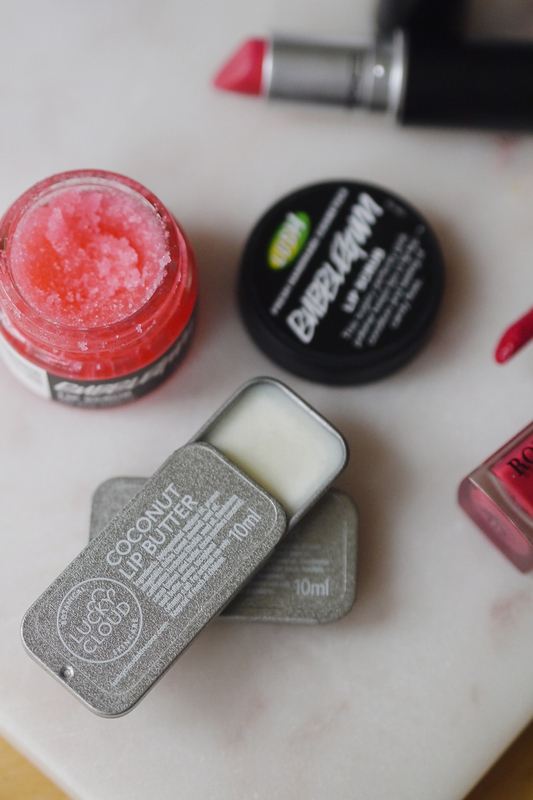 From moisturising balms to exfoliating scrubs, here are a few of my favourite essential lip products. As well as more intense lip balms to use as treatments, I always like to have a lip balm in my handbag for daily use. I like to use something that’s light but still hydrating (and preferably something with a nice scent! ), so the Lucky Cloud Lip Butters are perfect for this. I think I have one of each scent now as they’re the ideal dinky size for shoving in your bag or pocket for daily use. I love the Chocolate Lip Butter and the new Blooming Marvellous Lip Butter (with notes of vanilla, rose, lemon and strawberry) which has been produced in collaboration with eteaket to match their Blooming Marvellous Green Tea. All of Lucky Cloud’s products are vegan, and the lip butters are packed full of coconut and cocoa butters, sweet almond, thistle and vitamin E oil to help protect your lips.